Kuala Lumpur (called simply KL by locals) is the federal capital and the largest city in Malaysia. Literally meaning “muddy river confluence” in Malay, Kuala Lumpur has grown from a small sleepy Chinese tin-mining village to a bustling metropolis of around 6.5 million (city-proper population of 1.8 million) in just 150 years. A cultural melting pot with some of the world’s cheapest 5-star hotels, great shopping, even better food and some of nature’s wonders in just an hour away, this dynamic city has much to offer for every visitor. Kuala Lumpur is a sprawling city and its residential suburbs seem to go on forever. The city is a Federal Territory has an area of 243 km2 (94 sq mi) which consists of the city center and its surrounding urban areas, managed by the KL City Hall. It also merges with the adjacent satellite cities of Petaling Jaya, Subang Jaya, Shah Alam, Klang, Port Klang, Ampang, Selayang/Rawang, Kajang, Puchong, and Sepang, all in the state of Selangor, which enclaves KL, and all with their separate local authorities, creating a huge metropolis called Greater Kuala Lumpur, or more commonly, Klang Valley. The city can be divided into the following areas, each of which offers a particular attraction or activity. Old City Centre/Old Town [not to be confused with Kuala Lumpur City Centre (KLCC)] – This is the traditional core of Kuala Lumpur where you’ll find the former colonial administrative centre, with the Merdeka Square, Sultan Abdul Samad Building and Selangor Club. This district also includes Kuala Lumpur’s old Chinese commercial centre which everyone refers to now as Chinatown. Golden Triangle – KL’s equivalent of the Central Business District (CBD) located to the north-east of the old city centre/old town. This is where you will find many of the city’s shopping malls, five-star hotels and the iconic Petronas Twin Towers. Tuanku Abdul Rahman / Chow Kit – This extension of the old city centre/old town is fast regaining its old fame after a decade of slow growth. Located 500 m north of Chinatown and 500 m west to the Petronas Twin Towers, this is the traditional colorful shopping district of Kuala Lumpur north of the city centre that moves into high gear when the festivals of Hari Raya Puasa (Eid ul-Fitr) and Deepavali approach. Located just beside the Golden Triangle (northern neighbour) with many popular budget accommodations. The gigantic Putra World Trade Centre & the traditional Kampung Baru food haven are among the most important landmarks. Brickfields – This area, located south of the city centre, is Kuala Lumpur’s Little India filled with saree shops and banana leaf rice restaurants. Kuala Lumpur’s main railway station, KL Sentral, is located here. Bangsar and Midvalley – Located south of the city, Bangsar is a popular restaurant and clubbing district while Midvalley, with its Megamall, is one of the city’s most popular shopping destinations. Damansara and Hartamas – Largely suburban, these two districts to the west of the city house some interesting pockets of restaurants and drinking areas. This district also merges into the northern part of Petaling Jaya. 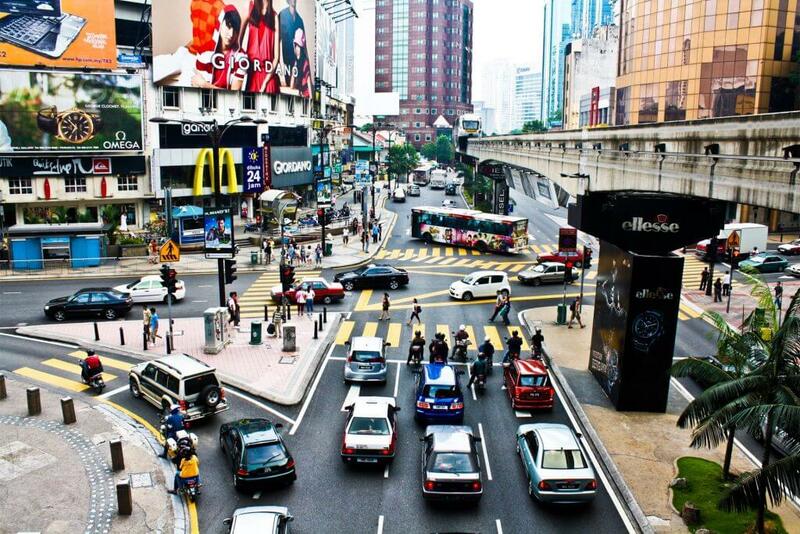 Ampang – Located east of the city, Ampang is home to Kuala Lumpur’s Little Korea and most foreign embassies. Northern suburbs – This huge area to the north of the city is home to several natural wonders attractions, such as the Batu Caves, the National Zoo and the Forest Research Institute of Malaysia. Southern suburbs – This district may not interest travellers much, although Kuala Lumpur’s National Stadium and National Sports Complex Bukit Jalil and Putrajaya are located here.